Very often writer’s block is a manifestation of a life block. Clear one and the other will disappear. You are only one book away from writing and publishing your own book. 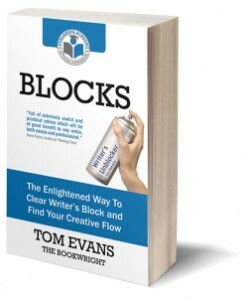 Blocks is an easy to follow guide to unlocking your true creative potential. This practical and comprehensive book takes you on a journey of the mind to help you banish your blocks forever and tap into an abundant flow of inspiration and creativity. This book is for anyone who writes regularly, whether professionally or for pleasure. Nearly everyone will at some point have found themselves unable to get into their creative flow and achieve the literary results they are looking for. ‘Blocks’ explains why we get stuck and how to get unblocked. Note that although ‘Blocks’ was written primarily for authors, it can equally be used by artists, musicians and any one involved in any creative process. 1. So Why Write A Book? 4. So What’s Stopping You? And here’s the mind map I used to write the book from.